Which fight gets the vote for 2017's Upset of The Year - so far? Which fight gets the vote for 2017’s Upset of The Year – so far? There is still some way to go before we reach the end of the year, 2017 proving to be a good one for boxing overall. And with a handful of big and significant fights still to come, chances are pretty good we could see another upset this month. But so far, in a year that has seen a few boxing shockers, which upset – which stunner – stunned you the most? Jeff Horn W12 Manny Pacquiao. July. Horn may have been unbeaten (and still is of course) but the boxer/school teacher was almost unheard of outside of his home country of Australia and Pac Man was almost universally expected to have an easy time with the man challenging for his WBO welterweight title. Instead, in what turned out to be a great battle, “The Hornet” stung the former pound-for-pound king badly, winning a fairly wide decision that was as controversial as it was unexpected. 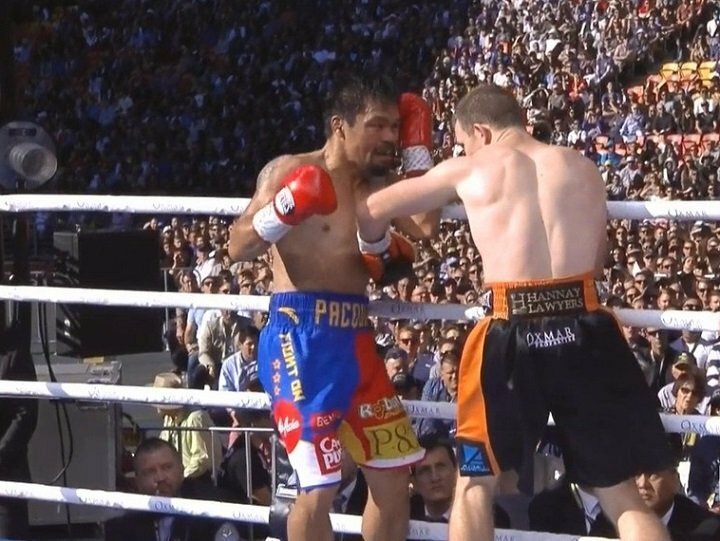 Many people moaned and groaned about the decision, but bottom line, Pacquiao gave away too many rounds, early on especially, and the gutsy Horn wanted it more. Tony Bellew TKO 11 David Haye. March. When this fight was first announced, almost everyone felt it was one huge step too far for former light-heavyweight, cruiserweight Bellew. Haye had dispatched two safety first, handpicked foes in his latest return, yes, but he was a legit heavyweight and his blend of speed and power promised to be too much for Bellew. Wrong. Instead, in what turned out to be gripping entertainment, Bellew capitalized when Hayes suffered a nasty Achilles injury, with the former WBA heavyweight champion almost unable to stand. Bellew poured it on and finally, after a brave showing from the one-legged Haye, the huge betting underdog bagged the TKO win. You are here: Home / Boxing News / Which fight gets the vote for 2017’s Upset of The Year – so far?